Most iOS users wouldn’t like to trade the user experience of their system with the one found in Android, yet it’s often nice to experiment with new user interface paradigms. Android Delete is a new jailbreak tweak that allows iOS apps to be deleted from the Home Screen just like they can on Android launcher. By default, in order to uninstall apps on the iPhone, iPad or iPod touch, users must simply press and hold any app on the homescreen and click on the “X” button over the icon of the app they want to remove. On Android, apps, or rather shortcuts, can be removed by dragging them into a trash can icon, a user experience many prefer, if it were for apps. Android Delete simply brings this paradigm to iOS by adding a trash can icon at the bottom of the screen whenever any app icon is pressed and held. From there, apps can simply be dragged to said trash can and be wiped off the device immediately, as shown below. 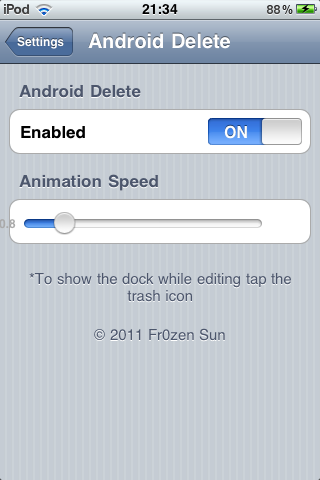 Android Delete also adds a new menu to the iOS native Settings app, allowing users to adjust the speed of the animations as well as temporarily disable this tweak completely. If you wish, you can still use the old iOS method of removing apps, even when this tweak is installed: just use the one you feel like using at any given time. I personally find the iOS method much more efficient and less time-consuming, yet I’m glad the choice is available. Some of you might have a different opinion. This tweak requires iOS 4.0 or above, just like most tweaks being released today. You can follow our step by step guide posted here to jailbreak your iPhone, iPad or iPod touch on iOS 4.3.5 using Redsn0w (or PwnageTool), or on iOS 4.3.3 using Redsn0w, PwnageTool, Sn0wbreeze & JailbreakMe (that last one being the easiest). In order to jailbreak your device, you’re advised to have some knowledge on basic iOS maintenance tasks, such as restoring your device from iTunes in case something goes wrong. Keep in mind that jailbreaking your device will void your warranty with Apple, therefore do it at your own risk. 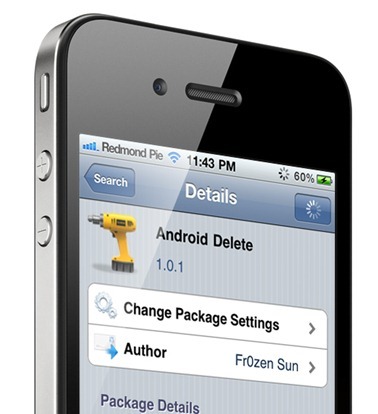 This tweak is available for $1.49 from Cydia’s BigBoss repository.